We have been seeing the Blue Ridge Mountains for a few days now. They have always been a little to the east of us, just looming. While we suffered over the rolling hills near the Shenandoah Valley, they seemed to just stand there, pointing and laughing. Little did they know that we had one more punch left in our legs. Well, not really a punch but more like a slap. Well, not really a slap, but we both still have 2 legs. We left Lexington this morning into another day that promised heat, humidity and one last tough, steep climb. The fog was back, making the early morning not quite as hot early on. 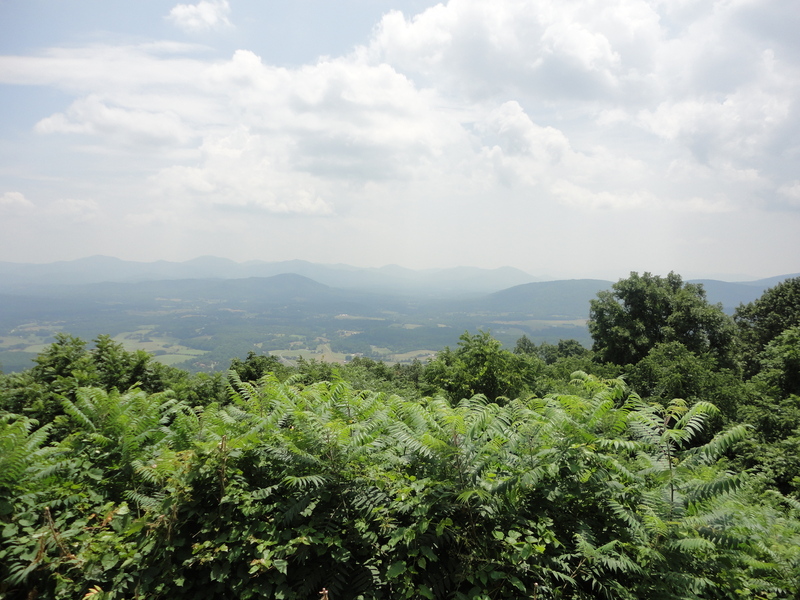 However, the course started with climbing, as the foothills of the Blue Ridge told us what to expect on the day. After 5 miles, we turned onto a river road that was a steady, slow climb for about 10 miles. The slope was very gentle, the river was gorgeous and the fog kept the heat in bay, so the riding was really nice. We were able to ride side-by-side with almost no traffic. Knowing what was coming, we settled into an easy pace and saved whatever was left in our legs. We took the time to talk about trivia, since we have already solved all the world’s problems on this trip. We reached our first rest area and found no open stores. This was not a good thing as we were getting ready to climb up to the Blue Ridge Parkway and didn’t know when our next service would be. So, we found a local church and filled our bottles, hoping they wouldn’t mind or at least would forgive us for not asking. We were in the village of Vesuvius. As soon as we left, the road turned up. The climb up to the parkway was tough, there were times our poor legs were screaming. I remember pulling so hard on my bars that my front tire came off the ground several times on the climb. The heat was building and occasionally I was thinking about looking for hand-holds. But, just like before, we kept turning the pedals over and we eventually saw the welcomed sign indicating the Blue Ridge Parkway. The next 25 miles or so were on the Parkway. Not easy, but beautiful. We had guessed that the elevation being at around 3,000 feet would not affect the temperature. We were very pleasantly surprised! 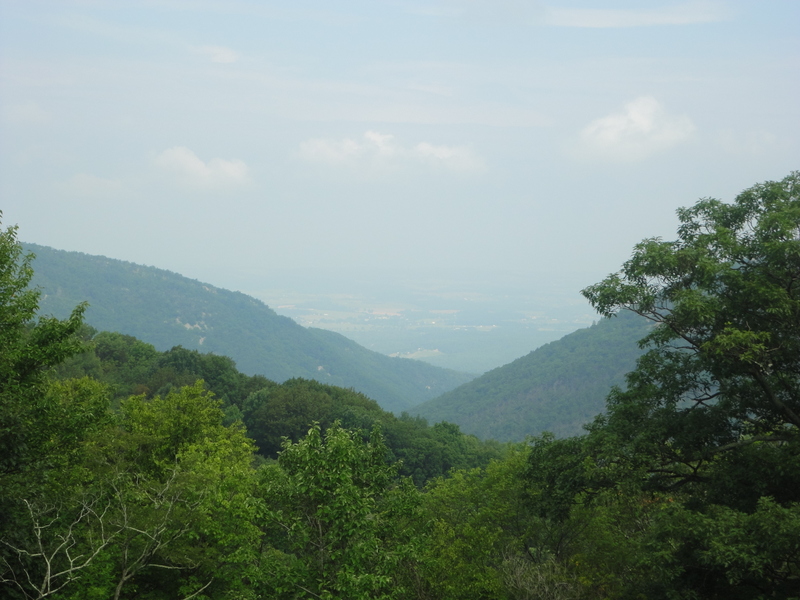 The temperature was several degrees cooler on the Parkway and the breeze was also noticeably cooler. We enjoyed the break in the heat. As we got toward the end of the Parkway, we pulled into a Visitor’s Center. There we made some new friends. Steve and Tim were just getting started on an adventure. 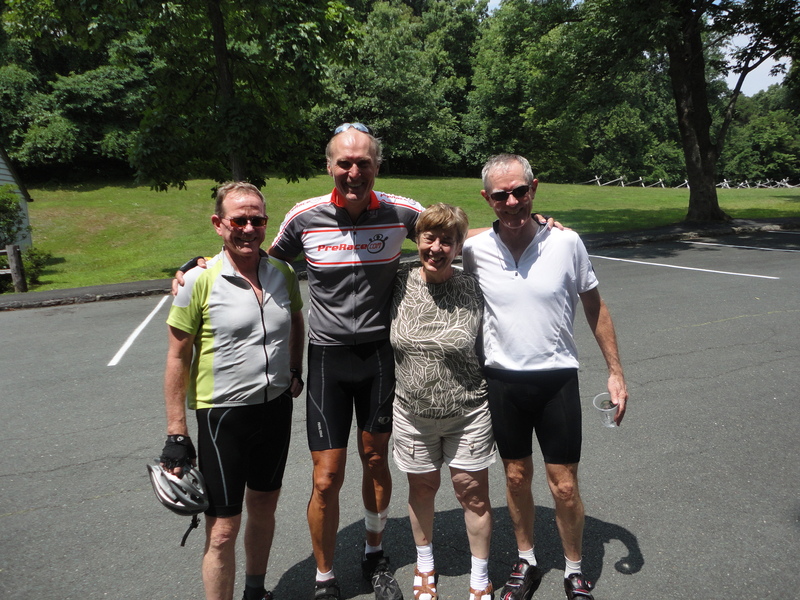 They, along with Carol in the support car, were going to ride the Blue Ridge Parkway to the southern terminus in the Smokies. They were experienced long distance cyclists and it was good to hear some of their stories and their wisdom. All 3 were such nice people and were great to talk with. We wish them well on their trip. After that, we cruised on down the mountain and headed to Charlottesville. We finally found a store and stopped and I got what has become my favorite ride food, a convenience store hot dog! I just can’t figure out why, with such smart food choices, we haven’t lost any weight. From there we were chased into Charlottesville by a rainstorm, but we escaped it and made it in, high and dry, making a 70 mile day in the Blue Ridge. Tomorrow we start heading southeast. We should be able to make Yorktown, on the Chesapeake Bay on Wednesday. 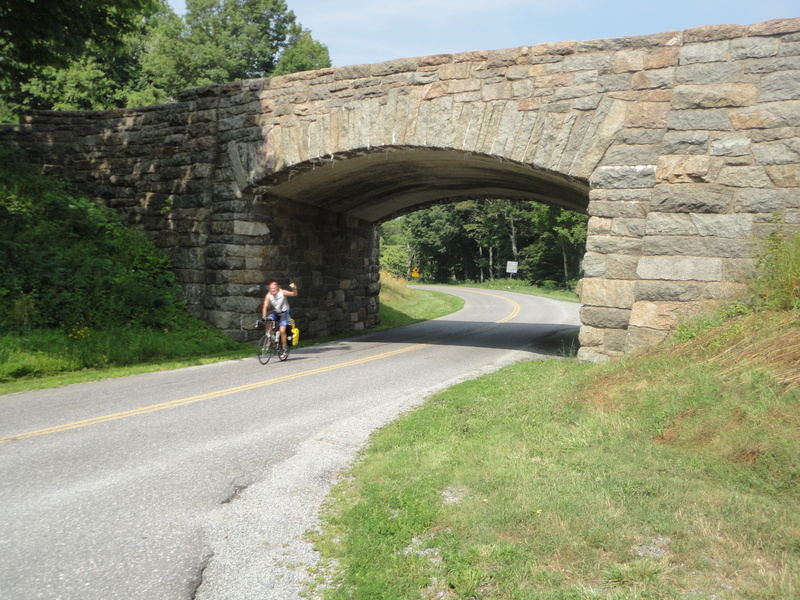 Yorktown is the official end of the Trans-America route. Gail and Mary Ann will meet us there. On Thursday, we will ferry our bikes across the James River and do the ceremonial final day ride to the Atlantic, complete with Champagne. We are not there yet, but, we are still in high spirits, feeling pretty good physically and continue to feel very blessed to get all the support we have been getting from friends and family. By the way, those people who have commented whom we have not met….we consider you in the “friends” category! Thanks for checking in. Howard just told me about your site and I am already addicted to reading it. I’ve been skipping around, but now realize that I will just have to start at the beginning and read it all the way through like a book. Congratulations to you and Ray. Enjoy your last few days. Mr. Sadler wants to know whats taking you so long. HA HA.From the guy’s at Don Sadler Car Care.